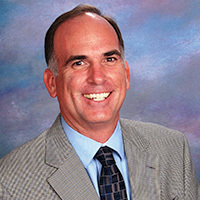 James (Jim) Langenbach is a Senior Principal Environmental Engineer for Geosyntec Consultants based in Florida with more than 20 years of experience focused on assisting clients with environmental assessments; remediation design and treatment system optimization; environmental management systems; sustainable remediation designs; and regulatory compliance. Getting it right the first time is vital when deploying aggressive remediation technologies in source zones. Essential to achieving the desired outcome is having a well-defined conceptual site model (CSM) in combination with a remedial strategy that provides a mechanism for optimization during implementation. After developing a CSM using high-resolution site characterization techniques and performing a remedial alternatives evaluation for a site impacted with chlorinated volatile organic compounds (CVOCs) at concentrations indicative of dense non-aqueous phase liquid, Geosyntec developed a remedial strategy involving large diameter auger drilling with steam and zero-valent iron injection (LDA/Steam/ZVI) to remediate a tetrachloroethene source and facilitate a transition to long term monitoring. The remedial technology involved using am 8-foot diameter auger to simultaneously mix the subsurface and introduce hot air/steam to promote thermal volatilization and stripping of CVOCs from soil and groundwater, followed by injection of ZVI as a polishing step to provide treatment of residual CVOCs. To focus the LDA/Steam/ZVI treatment in the depths and areas with the greatest CVOC mass, an optimization-focused treatment protocol was developed in which the number of treatment passes, ZVI injection quantity, and the addition of lateral step-out borings and vertical depth refinements were based on real-time data monitoring, including off-gas CVOC concentrations. During three months of remedy implementation, 500 lbs of tetrachloroethylene were extracted and treated, with most of the recovered mass being removed from two low hydraulic conductivity layers. Utilizing real-time data collection and an adaptive treatment protocol enabled immediate responses to boring-specific data observations and optimized remedial efforts to maximize treatment efficiency. Post-processing of the real-time data was performed to calculate the CVOC mass removed from each treatment boring and to visually present the distribution of mass recovered from each boring and throughout the treatment area. Over one year of post-remediation performance monitoring further documents that the remedial objectives were achieved with no CVOC rebound.